Whether your business provides customers with physical products, intangible goods, or a service, your main goal is always the same: maximum profit. This optimal price calculator will help you maximize your profit by analyzing the patterns of price vs. demand relationship. In this article, we will explain to you how to find the optimal price and accompanying quantity of units sold. Once you'll get a result, you can immediately use it to adjust the prices and enjoy maximized total profit! By definition, optimal price is the price per unit at which the overall profit (calculated as quantity multiplied by unit price) is maximized. Let's consider two shops selling notebooks, located at two sides of the same street. One of them sells high-quality notebooks at a price of $15 per unit. The other one sells very basic notebooks at $3 per unit. As you can expect, the shop with luxury notebooks will sell fewer notebooks per month. Still, their revenue per unit is high enough to allow for selling only a small quantity. The second shop, on the other hand, needs to sell a lot of notebooks to make a profit. Low price causes more customers to buy in their shop. At what price should I sell my product to optimize the profit? Marginal cost: this is the cost of producing one additional unit of your product. Typically, this cost is lowered with every item produced. Marginal revenue: revenue generated by selling one additional unit. 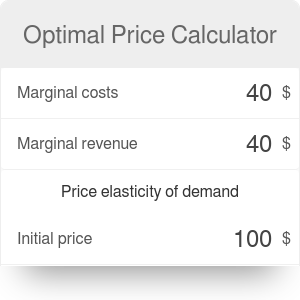 For an optimal price, the marginal revenue is equal to the marginal cost. Initial price and quantity: the initial behavior of the sales process - the price at which the product was sold, and the quantity that you managed to sell. Final price and quantity: the price of the product after a price change and the corresponding demand. Price elasticity of demand: optimal price is highly dependent on the elasticity of demand. In short, this value describes the relationship between price and demand for a certain product. where OP is the optimal price, MC is the marginal cost, and PED stands for price elasticity of demand. Optimal quantity: the actual number of units you will be able to sell at the optimal price. Profit at initial and final price: the profit generated when selling your product at the initial or final price. where OP is the optimal price, MC is the marginal cost, and OQ is the optimal quantity. Remember that the profit calculation does not show you the actual profit, as it assumes that every unit is produced at the same cost. If you want to analyze your profit in more detail, check the margin calculator and markup calculator. Optimal Price Calculator can be embedded on your website to enrich the content you wrote and make it easier for your visitors to understand your message.